Turf Moor was filled with Christmas cheer as the Clarets recorded their biggest league win in four years to beat Charlton Athletic 4-0 in an incredible game of two halves. In November 2011 Chris McCann netted a brace against Ipswich Town on home soil while Sam Vokes and Jay Rodriguez added to the scoresheet in an identical scoreline in the Championship. This time around it was Scott Arfield's turn to score twice with goals from leading scorer Andre Gray and Vokes helping the Clarets move clear of the chasing pack. 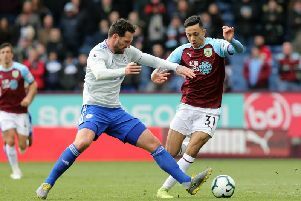 Burnley were desperate for a break, following a run of six games without a win, and Arfield obliged with a minute remaining of the opening half. The Scotsman added to his winner at Ewood Park in October when calmly guiding Matt Lowton's delivery past Stephen Henderson and in to the corner. However, the remainder of the half was severely underwhelming as the hosts failed to impact against an Addicks side that had been pulled in to the relegation zone having been consigned to six defeats in 10. Sam Vokes, without a goal in nine appearances, flicked wide unconvincingly in the opening minute after Andre Gray helped Ben Mee's throw in to the box. Mee then drilled wide of the near post from the angle of the penalty area after Gray and Arfield combined to work Lowton's lofted pass over to the left hand side. At the opposite end Ricardo Vaz Te, signed from Turkish side Akhisar B last month, sliced an effort comfortably wide after cutting infield from the left. The visitors probed again soon after and only an excellent challenge from Joey Barton prevented Reza Ghoochannejhad from converting Simon Makienok's centre from close range. The former Hammer went closer when taking on Michael Keane after Makienok had flicked on Henderson's punt forward and firing in to the side-netting. Lowton, one of two changes enforced by boss Sean Dyche as he stepped in to the XI for Tendayi Darikwa while Vokes replaced David Jones, proved a key outlet for the Clarets as the hosts looked to open Charlton up from the flanks. The one-time Aston Villa defender provided another delivery midway through the half to find Vokes but the Welshman's header drifted wide of the target. The striker then had the ball taken off his head from Barton's set-piece with Henderson slow to respond. Karlan Ahearne-Grant replaced the injured Vaz Te for the away and the substitute should've broken the deadlock within minutes of his introduction. The teenage midfielder raced in to a hole in the Clarets rearguard to meet Reza's cross but the youngster couldn't adjust his feet in time to steer the ball past Heaton. Gray's blushes were spared by the linesman's flag as he blazed over the bar when unmarked from close range after Arfield had flicked on Lowton's cross. Once Heaton turned Johnnie Jackson's piledriver over the bar it seemed as though the scoreline would be goalless at the interval. But Arfield had other ideas. Gray broke, fed Lowton down the right hand side, and after the record signing miscued from the resulting cross, Arfield coolly stroked the ball in to the corner despite the best efforts of Patrick Bauer on the line. The transition after half-time was nothing short of a Christmas miracle as the Clarets took command. The home side threatened early on when Vokes steered wide from close range after Lowton's assist had crept through the legs of Bauer. The Addicks, however, failed to heed that warning and the Clarets doubled their advantage within eight minutes of the restart. Barton played the corner short to man of the match Dean Marney, after Vokes's initial effort had been deflected over the bar, and the midfielder squared the ball to Arfield to fire home from inside the penalty area. Two minutes later, the Clarets led 3-0. Lowton cut out Morgan Fox's pass to provide George Boyd with possession and the winger's incisive pass was confidently tucked in to the corner by Gray who opened up his body to bend the ball around the outstretched arm of Henderson to register his 12th goal of the term. Heaton sprawled to his left to beat Reza's attempt to safety as the Iranian forward met Ahearne-Grant's cross while Jackson was also denied by the Clarets skipper shortly after. A second half interlude saw Barton entertain the crowd while Bauer trudged off the field through injury, and the Clarets spent the remainder of the half toying with their opponents. Arfield's deflected strike grazed the toes of Gray, who looked odds on to poke the ball beyond Henderson after racing goal side of his marker, before Vokes glanced Barton's corner just wide of the far upright. But Vokes completed the scoring, to net his first goal since victory other Rotherham United at the New York Stadium, in the 78th minute. Lowton again provided the assist and the Welsh international flicked an effort in to the far corner after the ball kissed the upright. Henderson made a smart save to deny substitute Rouwen Hennings at the end but Burnley bounced back with a bang. They travel to the KC Stadium to take on Hull City on Boxing Day next.